Louisville Athletics Photo. Louisville women's basketball head coach Jeff Walz celebrates after the Cardinals won the Atlantic Coast Conference Tournament championship. Walz is the guest speaker at the Highlands Alumni Dinner on April 13. 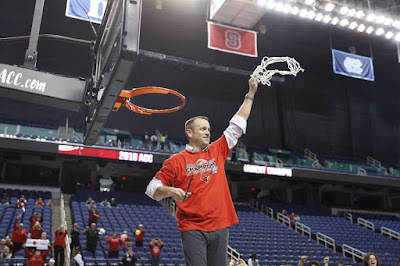 Jeff Walz has not hesitated to throw some good one-liners out during post-game interviews. After a win over Tennessee in 2013, the University of Louisville Cardinals women's basketball head coach and 1990 Highlands alum told ESPN, "We're the ugly ducklings that ruined the party." Then after a loss to Maryland, he told reporters, "You finish last, you come home with a trophy." Walz will be the guest speaker of the Alumni Dinner on April 13 at the Highland Country Club. A cocktail hour goes from 5 to 6 p.m. before the program begins. The cost is $30 per ticket. Walz will pave the way for the evening's honorees. Tom Jones (Class of ’63) will be honored as Alumni of the Year. Teachers of the year include Bill Poff (Highlands High School), Kevin Nieporte (Highlands Middle School) and Nancy Browning (Johnson Elementary School). Walz has led the Cardinals to new heights in his 11th season at Louisville. Walz has led the Cardinals to a 32-2 record including 15-1 in the Atlantic Coast Conference and a ranking of third in the country in both the Associated Press and USA Today polls. Walz earned the ACC Coach of the Year award as a result. The Cardinals are 295-95 since he took over the program in 2007. They have gone to the NCAA Tournament eight straight years and all but one season during that time. Louisville has gone to the Sweet 16 seven times and finished national runner-up twice under Walz in 2009 and 2013. But for the first time this season under Walz, the Cardinals won both the ACC regular season and tournament titles beating the University of Notre Dame twice this year. The Cardinals had not won a conference tournament since winning the Metro in 1993. But a big reason for that is Louisville spent a number of years in the Big East with the University of Notre Dame and the University of Connecticut. Louisville improved to just 3-12 against Notre Dame during Walz' tenure, but is still looking for that first win over UConn. The Huskies beat the visiting Cardinals, 69-58 on Feb. 12 to drop Louisville to 0-13 in the series since Walz became head coach. The only conference loss came to Florida State. Louisville enters the NCAA Tournament as a top seed for the first time in school history at the KFC Yum Center in downtown Louisville. The Cardinals take on 16th-seeded Boise State on Friday at Noon. The winner takes on either Marquette or Dayton on Sunday.